New XI Plus Superior Wall has R-21.3 built in! Advanced Concrete has began offering a next generation insulated precast concrete wall system in April 2012, the XI Plus. The XI Plus wall system has insulation in the wall cavity equal to 21.3 R-value and maintains all of the features of the fully engineered XI wall system. When provided with 1/2″ of Dow® THERMAX™ insulation and 4-1/2″ of rigid foam insulation, the Xi Plus has an insulation value of R-21.3. Four insulated access holes are now included in each standard stud to provide greater ease in wiring and plumbing. The Xi Plus also comes with a four inch insulated bottom footer beam. The 4″ standard floor slab may be poured equal to the height of the footer beam, eliminating the need for an additional screed board, saving time and money in the construction process. XI: X-TRA Strength. X-tra Insulation. The Xi wall has an insulated value of R-12.5 and utilizes 2.5 inches of Dow STYROFOAM built into the wall cavity for energy efficiency. 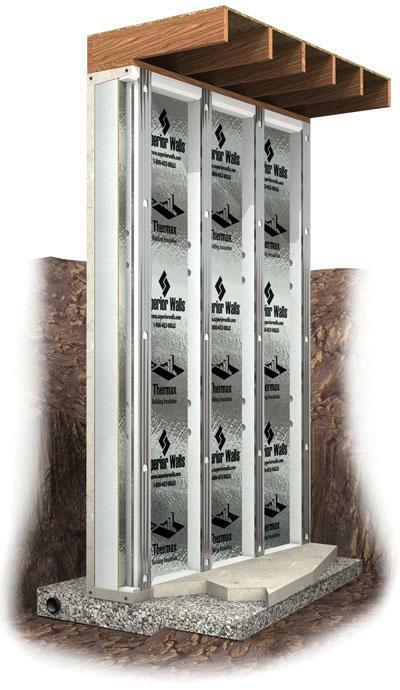 Additional cavity insulation may be site-installed to maximize insulation up to a value of R-50 +. The Xi wall is insulated including corners, studs and top bond beam. The Xi wall is thermally insulated and isolated from the exterior elements. The Xi wall is monolithically poured (poured all at once) with high-strength concrete for solid structural integrity and reinforced with steel rebar and polypropylene fibers. The Xi wall’s special high strength, low-water concrete mix also requires no additional damp proofing, benefiting from technology developed for the original R-5. The Xi meets or exceeds energy conservation requirements from both the IECC and the IRC (zones 1-5). The Xi has a striking modern look before drywall installation due to the galvanized steel stud facings that have replaced treated wood nailers. The high-tech engineering and numerous advanced features of the Xi make it the foundation of the future and the only choice for selective homeowners. Superior Walls products are insulated precast concrete wall systems that are custom manufactured to each building’s specification. 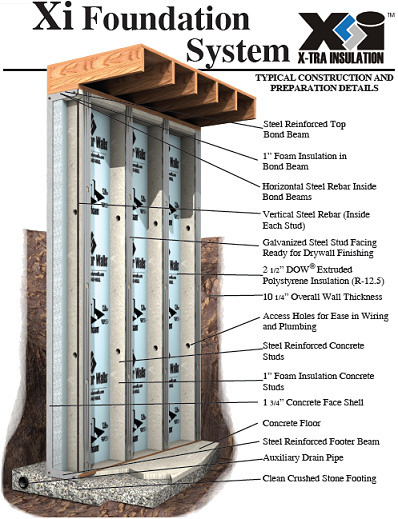 The Xi product forms a concrete cavity wall panel with concrete studs at 24 inches on center attached at the top and bottom with bond beams and the entire assembly is faced with an integral concrete face shell. The wall is reinforced with rebar and polypropylene fibers providing additional structural strength. In addition, the concrete studs are cast with holes for wiring and factory galvanized steel on each stud for interior finishing. Superior Walls panels are available in a variety of standard heights and custom lengths to suit your project. The maximum axial load (uniform house weight) for this product is 5500 pounds per linear foot. Special point loads up to 50,000 pounds can be accommodated. Superior Walls Xi product is warranted for 15 years against defects in workmanship and side wall water penetration. Each manufacturing plant is regularly inspected by an independent third-party inspection agency to ensure compliance with the Quality Assurance program. In addition, manufacturing and installation personnel are certified by Superior Walls of America, Ltd. The concrete used in Superior Walls wall systems provides protection against freeze/thaw cycles and water vapor transmission. The urethane sealant used between panels provides superior protection against water penetration. Therefore, no additional dampproofing materials are required. The closed cell polystyrene material in the Dow STYROFOAM Insulation provides a vapor barrier for Superior Walls panels. Dow STYROFOAM Insulation exhibits the following surface burning characteristics: flame spread 5 and smoke developed 165. Superior Walls products qualify as a two-hour fire separation wall when two layers of 5/8″ Type ‘X’ drywall are applied to the studs.